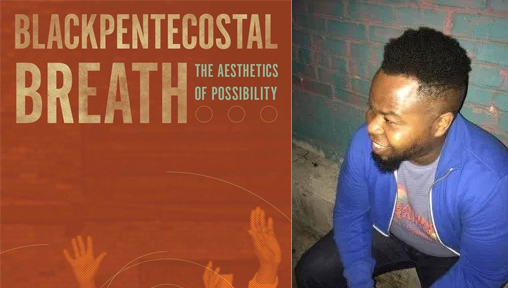 On Saturday, April 21, from 5-7pm, Counterpath (7935 Easat 14th Ave.) is excited to host a talk with Ashon Crawley, author of Blackpentecostal Breath: The Aesthetics of Possibility (Fordham UP, 2017). Also presenting from new work will be Jennifer Scappetone and Sasha Steenson, as well as Jim Miranda. The event is free and open to the public, and is also a pot luck early dinner (main dish provided but please bring what you can!). Ashon Crawley is Assistant Professor of Religious Studies and African American and African Studies at University of Virginia. His research and teaching are in the areas of Black Studies, Performance Theory and Sound Studies, Philosophy and Theology, Black Feminist and Queer theories. Blackpentecostal Breath: The Aesthetics of Possibility engages a wide range of critical paradigms from black studies, queer theory, and sound studies to theology, continental philosophy, and performance studies to theorize the ways in which alternative or “otherwise” modes of existence can serve as disruptions against the marginalization of and violence against minoritarian lifeworlds and possibilities for flourishing. Examining the whooping, shouting, noise-making, and speaking in tongues of Black Pentecostalism–a multi-racial, multi-class, multi-national Christian sect with one strand of its modern genesis in 1906 Los Angeles–Blackpentecostal Breath reveals how these aesthetic practices allow for the emergence of alternative modes of social organization. These choreographic, sonic, and visual practices and the sensual experiences they create are not only important for imagining what Crawley calls “otherwise worlds of possibility,” they also yield a general hermeneutics, a methodology for reading culture in an era when such expressions are increasingly under siege. Jennifer Scappettone is an artist and scholar whose work revolves around texts performed, translated, and set to the page, with recent projects focused on issues of ecology, labor, and citizenship. She is the author of the cross-genre verse books From Dame Quickly and The Republic of Exit 43: Outtakes & Scores from an Archaeology and Pop-Up Opera of the Corporate Dump, and of the critical study Killing the Moonlight: Modernism in Venice. Her translations of the polyglot postwar poet and musicologist Amelia Rosselli were collected inLocomotrix, which won the Academy of American Poets’ Raiziss/De Palchi Prize. New writings can be found in Asymptote, Boston Review, Jacket2, Nuovi argomenti, Terrain Vague: The Interstitial as Site, Concept, Intervention, and in the upcoming catalog for the US Pavilion of the Venice Architecture Biennale, Dimensions of Citizenship. She has collaborated on site-specific works with a wide spectrum of designers and performing artists at locations ranging from the tract of Trajan’s aqueduct below the American Academy in Rome to the São Bento Monastery in Porto. Her newest publication is Smokepenny Lyrichord Heavenbred: Two Acts, a free e-chapbook from The Elephants hailing from a libretto composed for live mixed-reality performance with writer and code artist Judd Morrissey and artist/technologist Abraham Avnisan. Installations of her visual poetry were exhibited most recently at Una Vetrina in Rome and WUHO Gallery in Los Angeles. She is an associate professor at the University of Chicago and keeps an online archive at http://oikost.com. Sasha Steensen is the author of four books of poetry: House of Deer (Fence Books), A Magic Book (Fence Books), The Method (Fence Books), and Gatherest (Ahsahta Press). She has published several essays including Openings: Into Our Vertical Cosmos, which can be read at Essay Press (http://www.essaypress.org).She serves as a poetry editor for Colorado Review and teaches Creative Writing and Literature at Colorado State University. Jim Miranda is a PhD candidate who is currently working on his dissertation: Border Transits: Geographies of Dispossession, Embodiment, and Possibility in Latinx and Indigenous Literature. In addition to following migrant and indigenous movements though texts, he has likewise found himself on buses to the Guatemala-Mexico border, traveling through the Sonoran Desert, and volunteering at migrant shelters from El Paso, TX to Tapachula, Mexico. This emphasis on movement and crossing serves as an epistemological starting point and extends to his scholarship which moves between and across disciplinary boundaries. Ultimately, Jim hopes his project will provide a multivalent geography of the borderlands that can reflect a region that has been shaped by histories of dispossession, practices of embodiment, and performances of new spatial possibilities. In addition to his work in Borderland Studies, Jim also finds himself drawn to the rhetorical potential of visionary allegories in an increasingly disenchanted world. Pursuing this interest has led to presentations at the Medieval Congress, where he discussed monstrous allegories in Dante’s Inferno, and at the Western Literature Association Conference, where he explored Geronimo as allegorical figure in Leslie Mormon Silko’s Almanac of the Dead. In his most recent poetic efforts, Jim brings these two interests into dialogue by using his own memories of transit or crossing as allegories for the complexity, dissonance, and (de)composition of Latinx experience.